With all that has already been written about President Abraham Lincoln’s assassination, one of the little known stories is the case of the only successful conspirator, John Harrison Surratt, the son of Mary Surratt, who was hanged for her part in the crime. 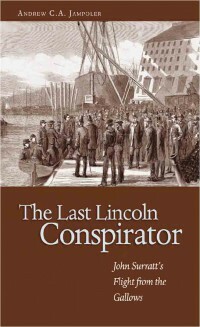 The Last Lincoln Conspirator is the true story of John Surratt, who became the most wanted man in America after the death of John Wilkes Booth’s and was the only conspirator to escape conviction.The capture and killing of Booth twelve days after he shot Lincoln and the fate of Booth’s other accomplices are familiar history. Four accomplices, including Surratt’s mother, were convicted and hanged, and four were jailed. John Surratt alone managed to evade capture for twenty months and, once put on trial, to evade prison. The first full-length treatment of Surratt’s escape, capture, and trial, this book provides fascinating details about his flight through Canada, England, France, the Papal States, and eventual capture in Egypt. Surratt’s desperate journey and the bitter legal proceedings against him that bizarrely led to his freedom hold the reader’s attention from first to last page.